I have two great personal items to report. First, this will be my last post for a while – I am moving onto my lambing ground for the next few months to stay with the herd and to work on another book. I’m planning for both relaxation and wild adventures. Husband Jim will be monitoring my email for me, and bringing me supplies. The second item is the publication of a paper by Jim and I in Sheep & Goat Research Journal. It’s about the use of livestock protection dogs in large carnivore country in the Northern Rockies. We believe that we need to go back and have another look at Old World knowledge so livestock operations can successfully co-exist in areas with large carnivores. When not out with the sheep, Rant has been curled up next to the shed the last few days, while Rena has been “guarding” the pipe rabbit habitat, which consists of stacks of fencing supplies and pipe, and miscellaneous equipment. Today when I came around the corner of the shed, I saw a pygmy rabbit drive underneath. Ah-ha! That’s why Rant has been hanging out there. I grabbed my camera and came back around the corner to find the pygmy rabbit was far faster than my camera focus. One more try later, I realized I needed a new tactic. I got in the truck and drove up to the front of the shed, and parked without getting out. I had the camera pointed on the opening under the shed, ready to rock. It took about five minutes before the little bugger came back out and I was rewarded for my efforts. Of course I have no idea, but I think this particular pygmy rabbit appears masculine, so I’ve decided it’s a boy and I’ve named him Buck. He was very tolerant about me sitting in the truck, shooting photos, so when I finished up, I dropped off a flake of alfalfa for him. His burrow is next to where Jim parks the tractor every night, and there is always a little alfalfa left in the bucket, so Buck should get fat. The funny thing is that although the U.S. Fish and Wildlife Service claims that pygmy rabbits are only associated with tall sagebrush, that’s not the case on our ranch. Here they are associated with low sagebrush, hard rocky soils and prairie dog colonies. We see pygmy rabbits every year here on the ranch. Although the FWS has determined that the pygmy rabbit may warrant protection under the Endangered Species Act, I would like to see more census effort made outside of tall sagebrush. I think they’ll find there are more than previously believed. I was late getting pictures loaded for Steve on a post he has dated April 23 on items he has for sale – so it just appeared today. Please look three posts down past Cat’s beautiful pictures to see it. These images were taken three days in a row this week, showing our changing spring conditions. Jim likes the dawn photo of the sheep on the move, comparing the rams to elephants. Wednesday was a bright, sunny day and I was despairing over our need for moisture. By Thursday, the moisture arrived. I was working outside near the house the other day, and saw Rena going across the ranch yard with a piece of pipe. What the heck? Noting her enthusiasm, which later became obsession, I knew something must be in the pipe. Rena was so intent on her task that when Rant came over to find out what was going on, she wanted no distraction, carrying her pipe, with its victim inside, around the yard and away from meddlers. I finally looked in the pipe and saw a cottontail rabbit firmly wedged in the middle, refusing to be dumped out either end. Rena gave up on getting her bunny to exit, but laid down to “guard” her pipe. 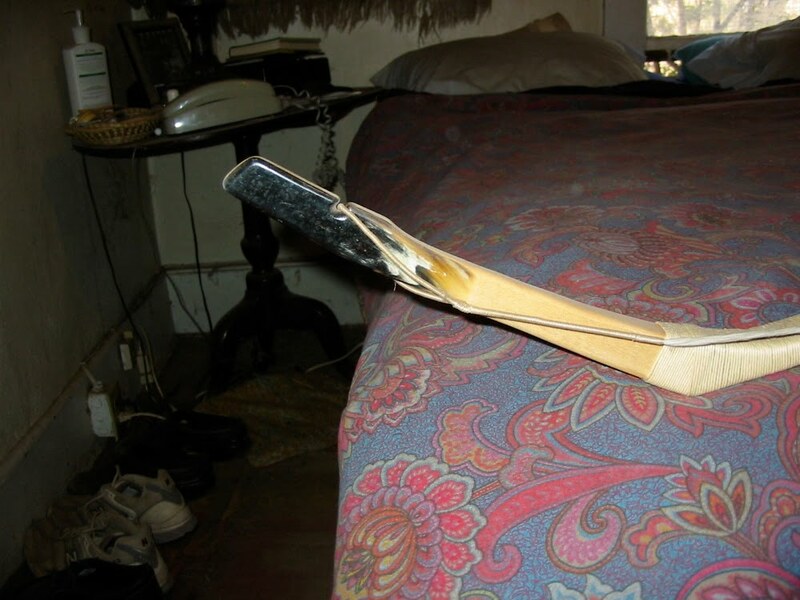 After a few hours, husband Jim removed the dog, and placed one end of the pipe under a ranch drag, so the victim could escape without attracting notice. I was relieved to check the pipe and find it empty yesterday morning. I think I finally got delinked from Facebook– users please tell me if this shows up there! I have some fun & informative things to share but am also trying to install and learn dictation software as though exercise strengthens my body nothing much helps dexterity and typos make me nuts! So first, a few things to sell, most not for EBAY. 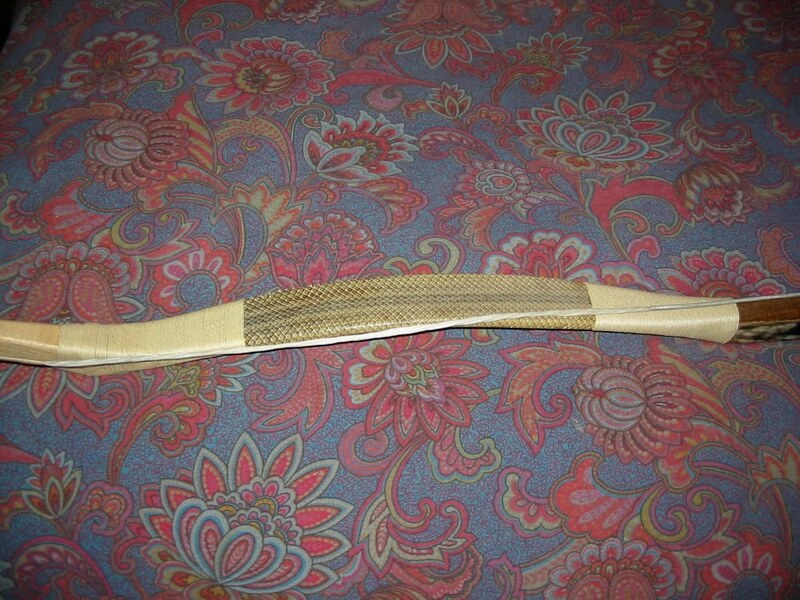 First, a Jay Fisher knife. I have no idea of the actual worth as he is NOT user- friendly– he explicately states he does not answer questions except about new commissions and hasn’t answered mine, which was given to me by a friend who had quarreled with him. 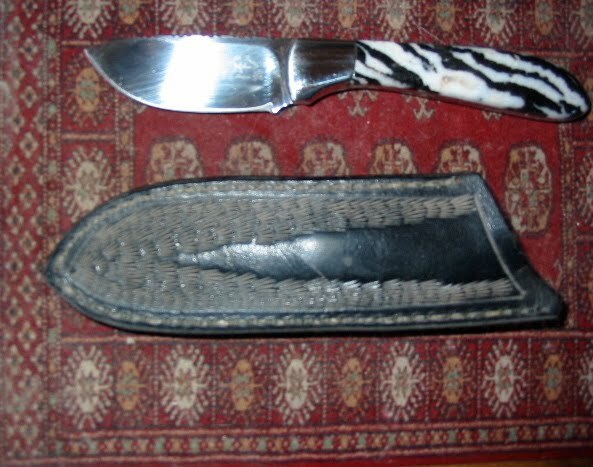 This is a fixed blade 2 1/2 inch– his fixed blades start at $600, and I believe this went for about $800 more than ten years back. New in sheath, $450 firm. 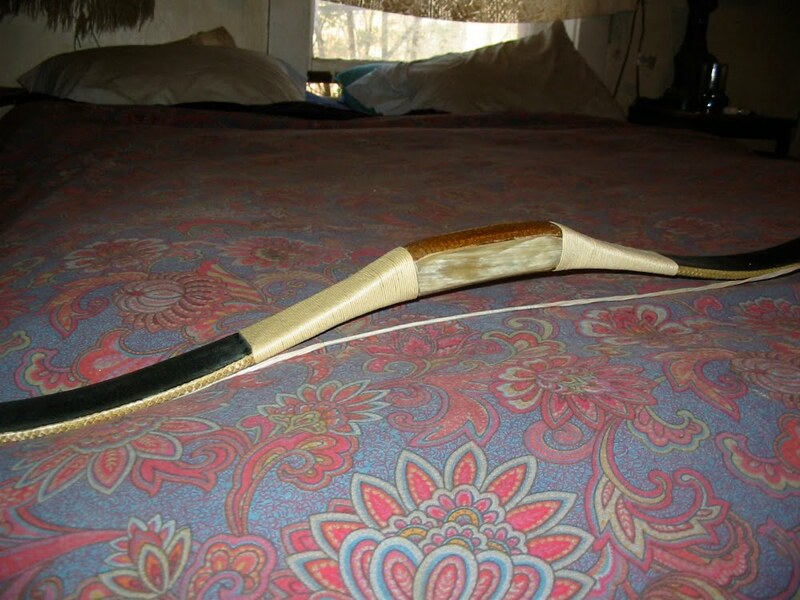 Second, a beautiful 65 pound pull Grozer recurve Mongol type bow. The draw weight was already bothering my arthritis and is impossible now. It is fancier and has more details than the ones on his site– ten years old or so, used only for targets. 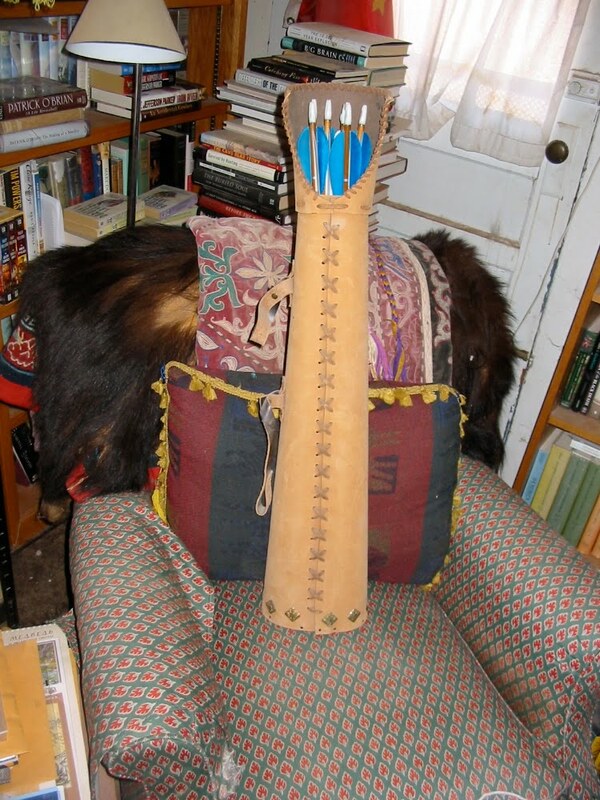 His bows go about $500 now– $500 for this with many more bells and whistles, including a quiver. Checking on the sheep herd in the pickup truck today, I drove near our currently vacant osprey nesting platform, which was installed by the power company in response to several fried birds and numerous power outages. I used the opportunity to shut off the motor and and read a first-draft manuscript aloud to Rena the guardian dog. Things were going well, with Rena listening attentively, when the osprey pair returned. The camera was on the dash, so I got a few images. Obviously, the birds were traumatized by my presence. My next nonfiction children’s book will be released this fall, so my publishing house is currently preparing the marketing plan. The book is about pronghorn antelope, and the photographer is my talented friend Mark Gocke. This is my first nature title for kids (my other books are about agriculture). If you’re a blogger or writer for a newspaper or magazine who would like an advance copy of the book for a review, please send me an email at catu2 at mac dotcom. Include your mailing address and we’ll see about getting you hooked up. Thanks for your help. Steve, you’re automatically on the list. It began innocently enough – Luv’s Girl (all white female Akbash) found a mouse and took it to Rant (male Aziat) and turned it loose. Rant was appalled. What the heck was that tiny thing that appeared to be about to attack him!?! Was it scary? Well it might be scary! To make it stop, put your foot on it. But then you can’t see it.